Today’s earliest adopters of wearable technology include some, but not only, the earliest tech adopters. The first 10% of connected adults are using any of a HeadCam (such as a GoPro), a fitness tracker (such as FitBit), or a Smartwatch. These leading users are 41% higher than the average connected adult in their share of Early Adopters for key tech products. 22% of these adults sporting a wearable device were the first in their age group to adopt a PC, Mobile phone, or Tablet PC. Expanding the definition of wearable technology to include actively used Bluetooth Headsets, this group accounts for 18% of connected adults. These wearable technology users also include a higher-than-average share of Early Adopters, with 21%. Although wearable technology products have been available and market-tested for decades, market conditions are finally pointing to this as an area of growth. Mobility as a lifestyle has expanded beyond the core road warriors into other market segments. Furthermore, awareness has broadened beyond the small set of enthusiasts. A substantial number of connected adults say they are eager to be “first” with wearable technology, and these aren’t only the early adopters. There always has to be someone who’s first, and a first time for everything. Early Adopters are a substantial force in technology adoption, and the starting point continues to get younger. Think back to the first time you used a Personal Computer or a Mobile Phone. Were you the first on your block, in your class, or where you work? If so, then maybe you are in that earliest 2.5% called Innovators. That’s one step ahead of Early Adopters, who are in the first one-sixth of users of any given product. For both PCs and Mobile Phones, market adoption is happening faster and earlier than before. 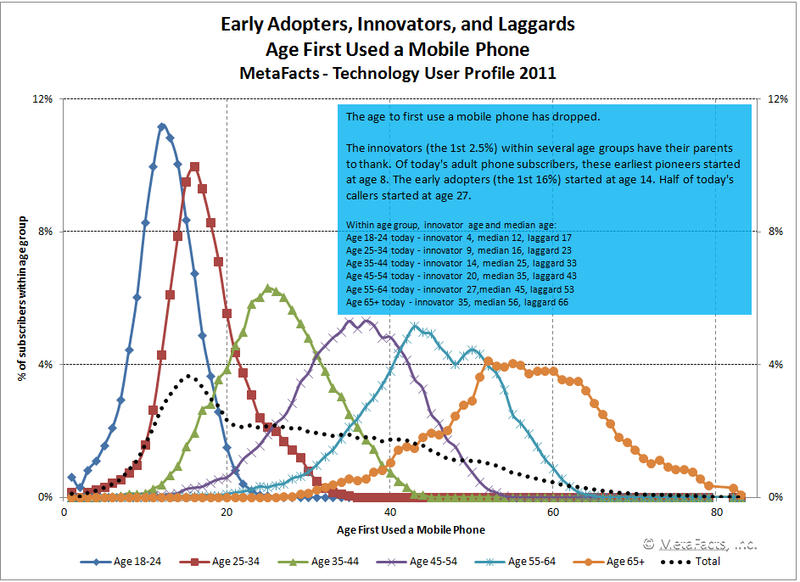 Among Mobile Phone users age 35-44 today, the first 2.5% in their age group to use a Mobile Phone – Mobile Phone Innovators – started at age 14. The Mobile Phone Laggards – the last 16% – started at age 33, a 19 year span. Among the 25-34 group, there are only 14 years between Innovators and Laggards. Simply put, Early Adopters behave and think differently than the Early Majority, as with the Late Majority compared with Laggards. PC Early Adopters crave details and innovation while PC Laggards feel overwhelmed. Laggards generally have lower socioeconomic status. PC Early Adopters use more PCs and other devices, and are also earlier adopters of Mobile Phones, eReaders, MP3 Players, and a host of other devices and services. Laggards have a simpler technology footprint. Early Adopters also choose different brands than the majority or Laggards. PC Clones, shunned by Laggards, rank relatively highest among Early Adopters, as do Apple and IBM/Lenovo brands. PC Laggards, on the other hand, have a higher rate of choosing Acer and e-Machines PCs. PC Laggards shop for home PCs at Wal-Mart, Target, or eBay, while the Early Adopters who aren’t assembling their own PCs shop more often at company stores such as Sony Universe or Apple retail. Mobile Phone adoption corresponds highly with PC adoption, although differs in several respects. Particularly, Mobile Phone Laggards strongly overlap with PC Laggards, while Early Adopters do less so. Like PC Laggards, Mobile Phone Laggards are similarly overwhelmed and ad-averse. Mobile Phone Early Adopters are more strongly adopters of home entertainment consumer electronics from Roku boxes to mobile wireless broadband, and network attached storage (NAS) to wireless keyboards. Mobile Phone Early Adopters have a higher share of subscribers who frequent LinkedIn, MySpace, and Google+ than Laggards do. Communication is big; more Early Adopters tend to use VoIP services like Skype for domestic and international calls than Mobile Phone Laggards. 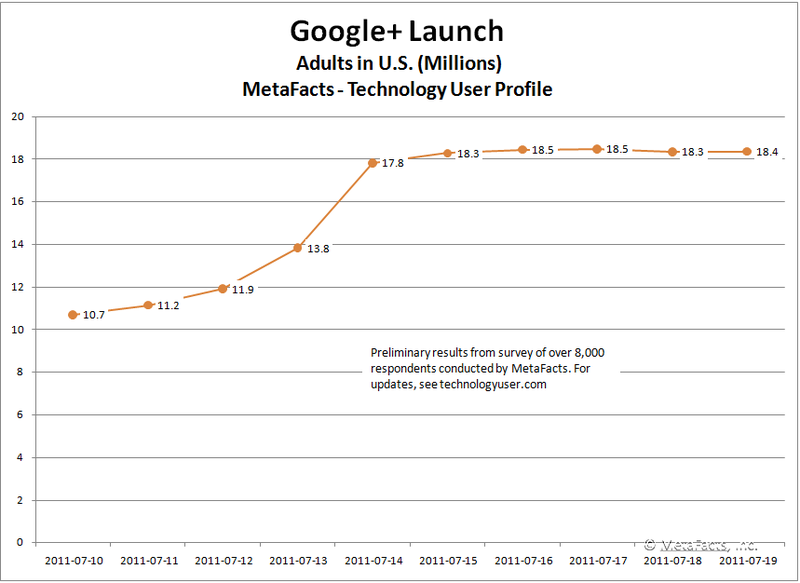 This is not to say that Early Adopters are good and Laggards are bad; simply that they are different. This has implications for forecasters and marketers alike, as it provides a fuller understanding of the adoption potential of other technology products and services. 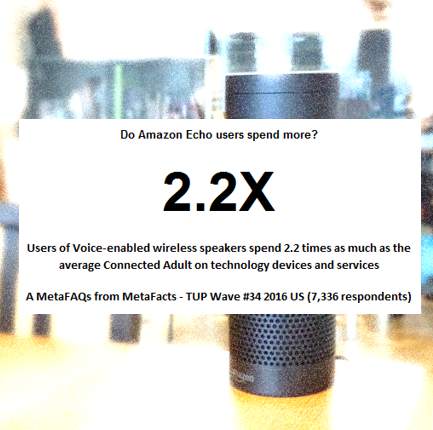 Using Technology User Profile, both the current wave and its previous 28 years, MetaFacts analyzes market adoption in many different ways. The age-banded approach analyzed here gives a high degree of explanatory power to how some market segments adopt technology much differently than others. We find that age alone does not predict market acceptance. In other words, it’s being young doesn’t mean you’re automatically an Early Adopter. While there is a certain trickle-down folklore which favors the “latest and greatest” products and features as driving adoption across all tech products, realistically, this technocentrism has not been borne out. In fact, focusing what people feel and do, and not on technology alone, gives a more solid foundation towards understanding, predicting, and creating the future. After all, people adopt technology, not the other way around. 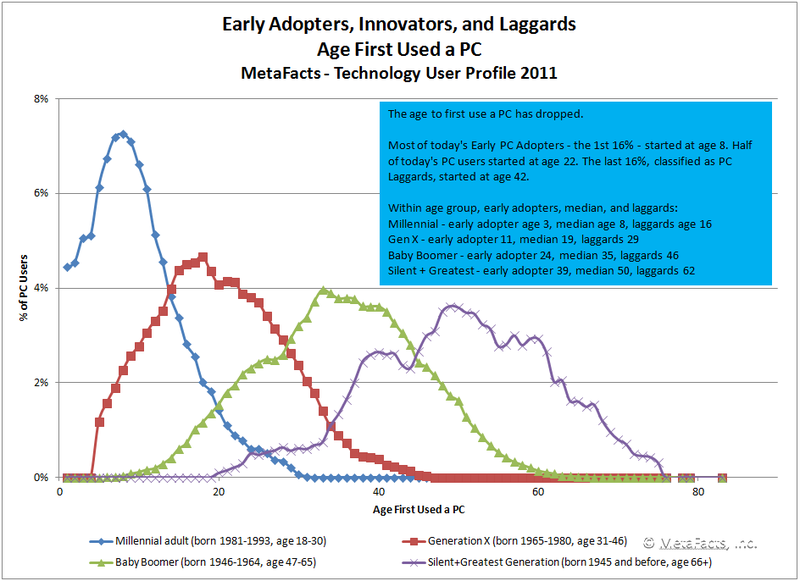 For this TUPdate, MetaFacts used two factors defining Adoption Stage: PC Adoption and Mobile Phone Adoption. In both cases, this is a straightforward measure of adoption based on the year they first used the product. Adoption stage was determined based on the respondent’s adoption age within each respondent’s discrete age relative to all other respondents of the same age.